This Chocolate Chia Seed Pudding is a healthy dessert that is rich and chocolatey and so delicious! Almond milk and maple syrup keep it paleo friendly and vegan. With only 5 ingredients, it’s an easy no bake chocolate dessert that everyone loves! I admit it. I have a huge sweet tooth. That can be a problem when it comes to healthy eating. I am constantly on the search for healthy desserts. Usually I top some yogurt with fruit, Yogurt with Blueberry Compote, but I was wanting something different. The struggle was real. Then I discovered chia seeds. Chia seeds are little powerhouses of nutrition – with lots of fiber and antioxidants. I could write a whole blog post on chia seeds alone, but someone has already done that for me – Health Benefits of Chia Seeds. What I love about chia seeds, besides how good they are for me, is that they have this magical ability to turn liquid ingredients into thick puddings. You can get a creamy pudding without cream and eggs. Difference between Raw Cacao Powder and Cocoa Powder – Raw Cacao Powder is made by cold pressing the cocoa beans, this keeps the living enzymes and removes the cocoa fat. Cocoa powder has been processed under high heat. Raw Cacao Powder retains more of the healthy benefits of the cocoa bean, though it is more expensive. In this recipe I used Raw Cacao Powder rich results in a strong chocolate flavor. Difference between black chia seeds and white chia seeds – there is no nutritional difference between white and black chia seeds! They are separated only for aesthetic reasons. I use black chia seeds for darker foods and white chia seeds for lighter foods. For this recipe, you could use black or white. 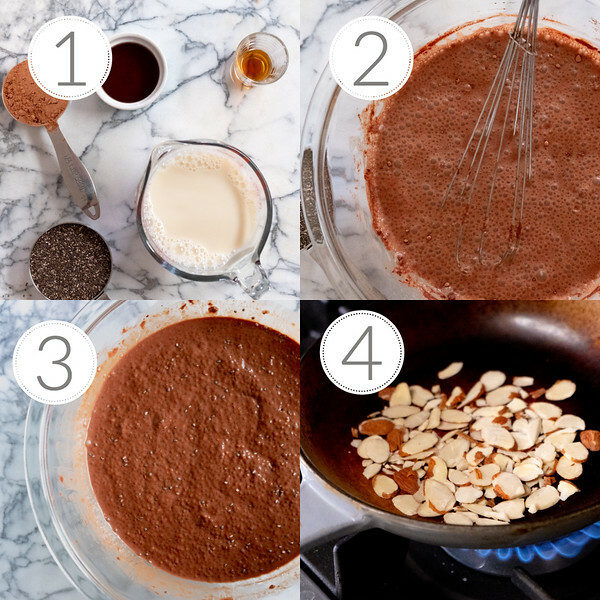 Step 2 – In a bowl, whisk together the cacao powder and almond milk. Then add the maple syrup, vanilla extract and chia seeds. Put a lid on the bowl and refrigerate for at least 4 hours, though I usually do overnight. You can stir it occasionally. Step 3 – Remove from fridge. If it’s too thick add a little more liquid, if it’s not thick enough stir in a little more chia seeds. Step 4 – Optional – toast some sliced almonds and dice strawberries to top the pudding. You can serve the delicious chocolatey chia seed pudding simply scooped into bowls. It’s so rich with chocolate flavor that you really don’t have to do anything else, but we like to vary it up a bit. This time we topped it with some toasted sliced almonds and a few diced strawberries. You could also use walnuts, sunflower seeds or whatever nuts you like. 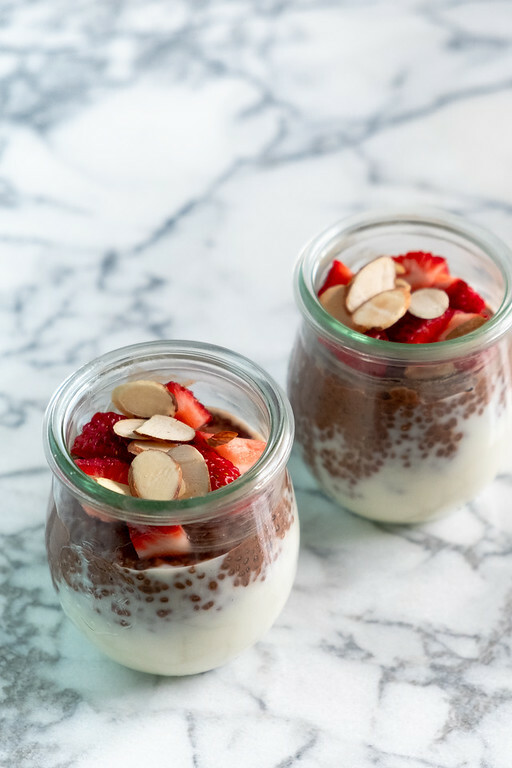 An easy chia seed parfait can be made by layering the chia pudding with plain or vanilla yogurt. It’s one of our favorite easy desserts. If you love chocolate as much as I do, you definitely need to follow my Chocolate Recipes Pinterest Board! 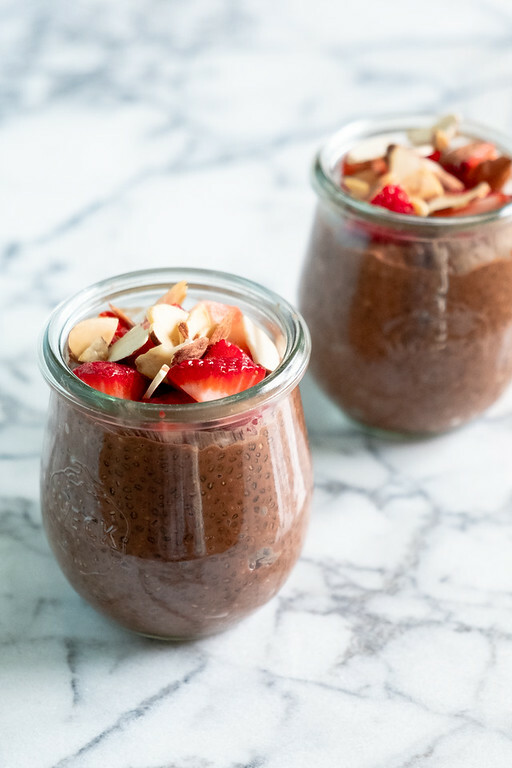 This chocolate chia seed pudding is so easy to make - only one bowl needed and it's a healthy no bake dessert that everyone loves! Whisk together the cacao powder with the almond milk in a medium bowl. Add the maple syrup, vanilla extract and chia seeds to the bowl and whisk to combine. Cover with a lid and refrigerate for at least 4 hours or overnight. Stir occasionally. Remove from fridge and stir. If it's too thick add a little more almond milk, if it's too thin, add a sprinkle of chia seeds. Difference between Raw Cacao Powder and Cocoa Powder - Raw Cacao Powder is made by cold pressing the cocoa beans, this keeps the living enzymes and removes the cocoa fat. Cocoa powder has been processed under high heat. Raw Cacao Powder retains more of the healthy benefits of the cocoa bean, though it is more expensive. Difference between black chia seeds and white chia seeds - there is no nutritional difference between white and black chia seeds! They are separated only for aesthetic reasons. I use black chia seeds for darker foods and white chia seeds for lighter foods. For this recipe, you could use black or white. I can vouch for the deliciousness of this recipe! My first chia pudding to try – and I won’t be going elsewhere. This is divine! Totally agree with you, I too am a fan of chia seeds as they make puddings super thick. Love this recipe coz it has chocolate!!! 😉 Can’t wait to give it a try! I have a huge sweet tooth too. I need to try this for a healthier way to curb it! Great recipe. You know, I never knew the difference between cocoa and cacao before. Very happy to now know the difference! I suffer from extreme sweet tooth, too! I’m not a fan of chocolate, but you know that there are menfolk in my house who are, and I’ll bet they would love this. 5 minutes to make and no cooking means I’d enjoy it, too! Chocolate and it’s good for you! This sounds so good! I haven’t ever tried a chia pudding before – must change this soon!